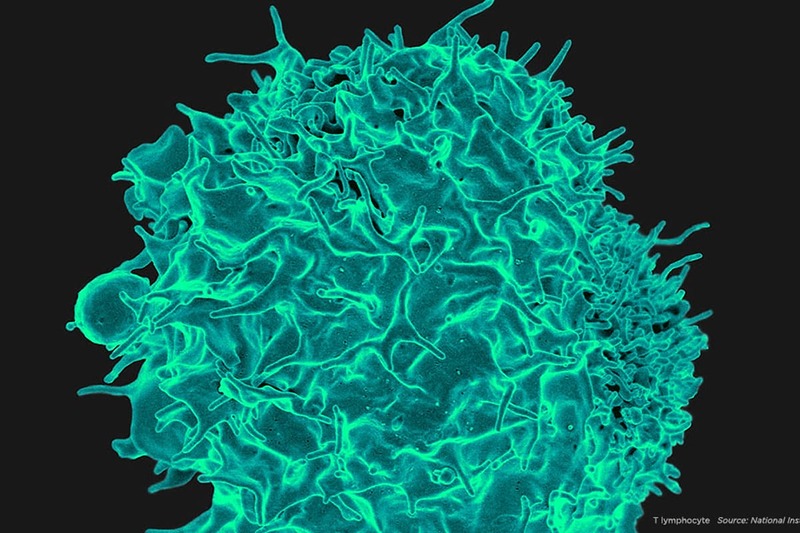 Human CAR T cells have been engineered to produce a protein that could treat lymphoma. Researchers have modified CAR T cells to produce a protein called HVEM that could treat lymphoma. When injected, the cells naturally zero in on the location of the cancer cells and churn out HVEM continuously for several days. This new immunotherapy approach could potentially transform the way blood cancers are treated. Memorial Sloan Kettering researchers have developed a potentially powerful lymphoma treatment using modified immune cells that function as on-site “micro-pharmacies,” churning out proteins for therapeutic effect. In experiments with human tumors transplanted into mice, the new immunotherapy approach produced significant responses, raising hopes that this technique could someday offer an effective way of treating this disease and possibly other cancers. The technique represents a new twist on a form of immunotherapy called chimeric antigen receptor (CAR) T cell therapy, which has demonstrated remarkable results in patients with other blood-related cancers. CAR T cell therapy involves removing immune T cells from a patient, genetically altering them to fight cancer, and giving them back to the patient in vast numbers. Historically, this form of therapy has aimed to give immune cells the information they need to better recognize tumor cells as foreign and attack them. The new technique illustrates an untapped potential of CAR T cells to act as targeted delivery vehicles by revamping them to produce anticancer agents. The CAR T cells continuously produce the protein right where it is needed. The researchers devised the innovative approach after making an important discovery about the biology of lymphomas, which usually arise in white blood cells called B cells and are characterized by uncontrolled growth. The researchers identified a critical pathway that is disrupted in approximately 75 percent of follicular lymphomas, a subset of B cell lymphoma. The pathway involves an interaction between two receptors on the surface of B cells, proteins called HVEM and BTLA. Normally, these receptors communicate with each other to keep B cells’ growth at a normal rate. If this communication is disrupted — if either receptor is not functioning properly — the cells will proliferate out of control. Dr. Wendel and colleagues found that the gene for HVEM is mutated in most follicular lymphomas, producing a faulty HVEM protein that perturbs the interaction with the BTLA receptor that sits on the surface of the cancerous B cells. This accessible location suggested that it might be possible to deliver the HVEM protein therapeutically and restore its cancer-suppressing function. The research team used human CAR T cells engineered to seek out cells expressing the CD19 protein, which is made by all B cells, both cancerous and normal. CD19 CAR T cells naturally home in on B cells and have recently produced stunning results in treating chemotherapy-resistant leukemia. 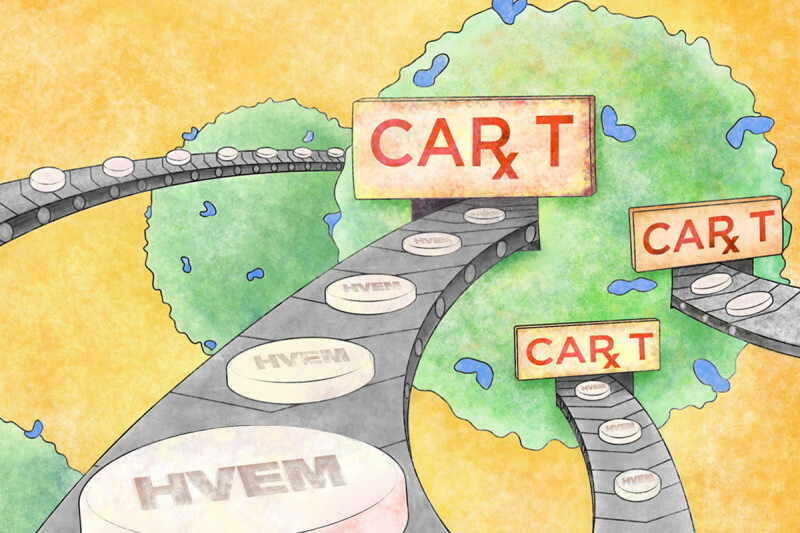 The research team modified the CD19 CAR T cells so that they would continuously produce the HVEM protein. “The CAR T cells pump out the protein for several weeks in one specific area — which is near the cancer cells,” Dr. Wendel says. When injected into mice that contained implanted grafts of human follicular cell lymphoma, the cells produced therapeutic responses that were far more significant than when using control CD19 CAR T cells that did not produce HVEM. The researchers reported their results online today in the journal Cell. “This shows a feasible way to put the brakes back on lymphoma cells by restoring the HVEM-BTLA interaction,” Dr. Wendel says. He adds that additional studies are needed to validate the effectiveness of this approach. Darin Salloum, a postdoctoral research fellow in Dr. Wendel’s lab, is further modifying the CAR T cells to produce altered versions of the HVEM protein in the hopes of making the treatment even more effective. Ultimately, pharmaceutical or biotechnology companies can license the technology to conduct a clinical trial. “Potentially, engineered T cells that function as ‘micro-pharmacies’ and deliver a range of anticancer drugs could transform the way we treat lymphomas and possibly other blood cancers as well,” Dr. Wendel says. are you doing anything for sage 4 ovarian cancer? Dear Keith, we are investigating the effectiveness of new treatments, including immunotherapy, for people with advanced ovarian cancer. To browse through these clinical trials, please visit: https://www.mskcc.org/cancer-care/types/ovarian/clinical-trials. If you have questions about any of these studies or would like to make an appointment for a loved one, please call our Physician Referral Service at 800-525-2225. Thank you for reaching out to us. I wanted to treat me with you ,but my insurance not I leave do I the referred.the is the best. Hi Yadira, we recommend that you contact our Financial Assistance Program. You can go to https://www.mskcc.org/insurance-assistance/assistance to learn more. Thank you for your comment. Will this new therapy work or possibly work for CLL patients? This technology is still in an early, investigative stage, so while we are very hopeful it will lead to effective treatments for various lymphomas and possibly other cancers, it is not possible at this point to predict if it will translate into therapies or when it might be available clinically. My husband has relapsed mantel cell lymphoma. Will this treatment be effective for him in the future? Ann, thank you for your question. Please do You tink this discovery will be use also for Mantle Cell Lymphom? How long we need to wait? FDA will give priority approval? Tks so much... With hopes!! Luigi, thank you for reaching out. Volanda, thank you for your question. My son, David Holder, was admitted to Sloan-Kettering in 2007-08. He was treated for non-Hodgkins Lymphoma T-cell nos. David died in Sept of 2008. I am wondering if these new immunotherapy attempts can now help T-cell nos. Nancy, we offer our deep condolences for the loss of your son. This technology is still in an early, investigative stage, so while we are very hopeful it will lead to effective treatments for various lymphomas and possibly other cancers, we cannot yet know if it will translate into a treatment for non-Hodgkins Lymphoma. Do you see HVEM therapy for follicular lymphoma as potentially superior to the genomic testing and targeted drug treatment approach which is currently in clinical trials? Deborah, thank you for reaching out. Thank you for your question. This immunotherapy technology is still in an early, investigative stage, so while we are very hopeful it will lead to effective treatments for various lymphomas and possibly other cancers, it is not possible at this point to predict if it will translate into therapies or when it might be available clinically. It is very possible that genomic testing and targeted drug treatment could someday be used in combination with this or a different immunotherapy. Would this therapy possibly help someone with Angioimmunoblastic T cell lymphoma? Barbara, thank you for reaching out. Would this be a potential treatment for Mantle Cell Lymphoma? Good morning, this technology is still in an early, investigative stage, so while we are very hopeful it will lead to effective treatments for various lymphomas and possibly other cancers, it is not possible at this point to predict if it will translate into therapies or when it might be available clinically. Is this new treatment showing promise for Hodgkin lymphoma as well, or only non-hodgkin lymphoma? Dear John, this technology is still in an early, investigative stage, so while we are very hopeful it will lead to effective treatments for various lymphomas and possibly other cancers, it is not possible at this point to predict if it will translate into therapies or when it might be available clinically. Will this be a treatment for Mantel Cell Lymphoma as well? Dear Jackie, this technology is still in an early, investigative stage, so while we are very hopeful it will lead to effective treatments for various lymphomas and possibly other cancers, it is not possible at this point to predict if it will translate into therapies or when it might be available clinically. Wen will the trials be avalible? MSKCC rock.Love this Institution. Dear Mario, thank you for your kind words! This technology is still in an early, investigative stage, so while we are very hopeful it will lead to effective treatments for various lymphomas and possibly other cancers, it is not possible at this point to predict if it will translate into therapies or when it might be available in clinical trials. Anyone working on whether this new Car-T version could be used for mantle cell lymphoma? Any chance this version of HVEM protein would also tackle mantle cell lymphoma? Dear Regina, this technology is still in an early, investigative stage, so while we are very hopeful it will lead to effective treatments for various lymphomas and possibly other cancers, it is not possible at this point to predict if it will translate into therapies or when it might be available clinically. I am certain I read onl.iine about a biotech co that is doing similar research several months ago. I beleve the co was located in northern California. I found this research to be amazing! of lymphoma being only 3% of the population. Could this be a form of treatment for me? Dear Donna, we are sorry to hear about your diagnosis. I know you are in early investigatinal stages but will it inculded possibly aiding towards treatment for indolent follicullar lymphoma. I have stage 4. Bridget, thank you for your question. Unfortunately, it is not possible at this time to know whether this approach will have effectiveness agains follicular lymphoma. Hopefully getting funded for such studies is necessary for any of this research to continue no matter how promising. Are you also familiar with the nano-particle treatment with HDL & gold for treatment of lymphoma and how is that progressing? Are you doing anything with this therapy in the field of metastatic colorectal cancer? Dear Todd, we do not currently have any trials looking at CAR T cell therapies for colorectal cancer, but we have a number of trials for colorectal cancer, including several that involve other types of immunotherapy. If you are interested in learning more and possibly making an appointment, you can call 800-525-2225 or go to https://www.mskcc.org/experience/become-patient/appointment for more information on making an appointment. Thank you for your comment.